This five-star hotel is rooted in history. At the center of the aristocratic social scene in Florence for over 500 years, the Palazzo Magnani Feroni is one of the oldest residences in the San Frediano neighborhood. It is ideally located near the Ponte Vecchio and the Uffizi, which are both within walking distance. This hotel hosts an elegant rooftop bar, nestled on a panoramic terrace that overlooks the city of Florence. You can even organize a dinner from this elegant vantage point with a private waiter if you’d like. This hotel prides itself on warm and engaging customer service, and offers a range of luxury amenities. Enjoy a white glove complimentary breakfast, and 24/7 room service. Schedule a masseuse to help you relax from a long day of exploring the city in the comfort of your own suite. Have you brought the little ones along and need a break for a romantic dinner? Schedule an in-suite babysitter to relieve you for a few hours. If you are looking for a fresh beauty look, a hairdresser or esthetician can come to your room and work their magic on you! Among other luxury hotels in Florence, the St. Regis is located in the Piazza Ognissanti, close to the Church of Ognissanti in central Florence—ideal for walking from your hotel to historic landmarks in the area. Although the St. Regis hotel is full of modern facilities, the building’s charm stems from its Renaissance period feel. The hotel has a variety of luxury options to choose from, like the crisply designed fitness center, which includes cardiovascular equipment, free weights, a treadmill, and more. For a relaxing day on your Italian getaway, explore a Tuscan vineyard in the morning, then check out the Iridium Suite in the afternoon: This is a private suite with a clean, elegant design intended to set the scene for your relaxation. Here, you can luxuriate in the services the spa has to offer, such as massages, body wraps,and facials. The Iridium Suite also provides services for men and children, and the unique opportunity to engage in massage lessons. This elegant Florence hotel is located in the Piazza Santa Maria Novella, just a short walk away from Via Tornabuoni, where the streets are bordered with boutiques. The Duomo is only 10 minutes away! The chic, modern designs featured in the J.K. Place are balanced with classic Florentine elegance. The services at the J.K. Place are also sure to delight you, with a check-in process that includes a welcome drink in the lounge-library to ease you into your stay. Once you arrive at your suite, enjoy a selection of fresh seasonal fruit, and an in-room complimentary mini bar filled with soft drinks. Your stay will also include a J.K. Buffet, where you will have the opportunity to enjoy free, homemade finger food and cakes. The Florence Fitness Gym is a 2-minute walk away, where you will have free access during your stay. Take advantage of the J.K. Terrace, where you can enjoy a delicious organic dinner nestled in the lively Santa Maria Novella square. Relax in the cozy Champagne Bar living room and sip on champagne, or enjoy a signature J.K. cocktail prepared by the hotel’s mixologist. The hotel was designed by Michele Bonan, with the idea that it would feel as though guests were sailing on a cruise ship over the Arno. This is the only townhouse that sits directly on the river, providing spectacular views of city buildings. 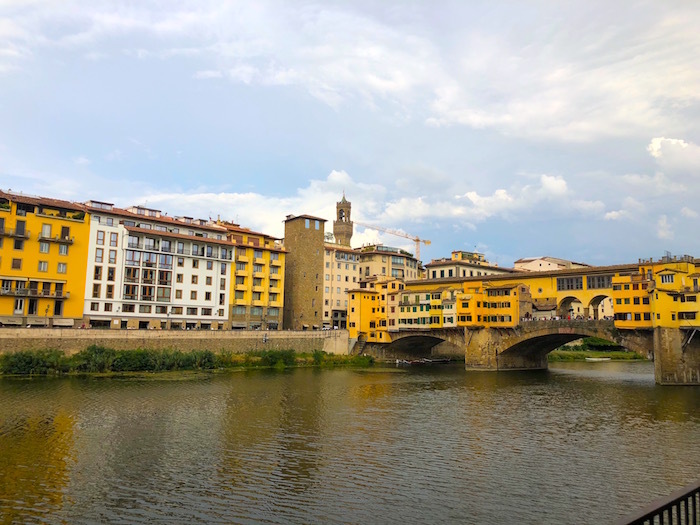 This hotel is only steps away from the historic Ponte Vecchio, which is open to pedestrians 24/7 for a romantic stroll outside of the closing jewelry shops in the evening, or leaning over the river and taking in the view. The Hotel Lungarno offers a range of immersive experiences for its guests. For one, you can schedule a session to capture their own photographs of Florence alongside the renowned photographer Gianluca Panella. For those who admire craftsmanship, guests can book a visit the Pampaloni silver factory. There, guests will witness expert silversmiths execute their talents. For guests who love a thrill, a ride through the winding streets of Florence on a vintage Vespa scooter will do the trick. Each participant will be chauffeured by an expert Vespa driver. This hotel maintains its early charm, while also accommodating guests in modern luxury. Recently renovated, the hotel features dining options like the gourmet restaurant Santa Elisabetta and the Tower Bar. At Hotel Brunelleschi, you will be located in central Florence, close to Piazza Duomo and the most popular monuments in the city. 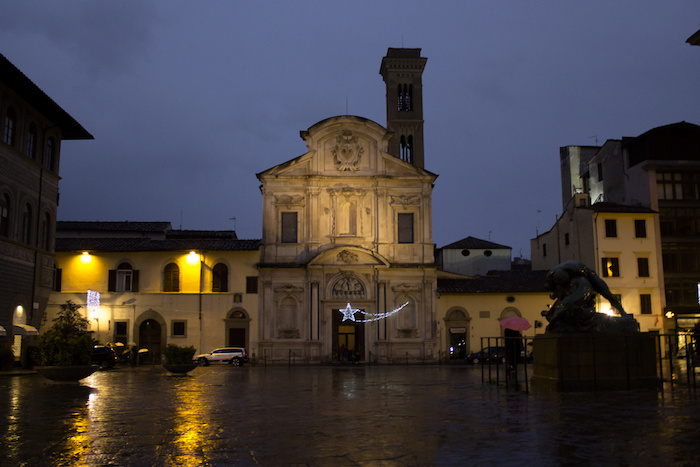 The Florence Cathedral and the Uffizi Museum are only minutes away on foot! Archaeological excavations of this hotel have uncovered precious finds, like a hammam used as a sauna in ancient times. After amazing discoveries like this, a museum was even created inside the hotel! Small pets are welcome, and there is even a dog sitting service available for you! Utilize the personal shopping service, to make the most of the upscale shopping scene. If relaxing in a deluxe Jacuzzi after a workout at the in-house gym sounds appealing, you might want to choose the Pool Suite! 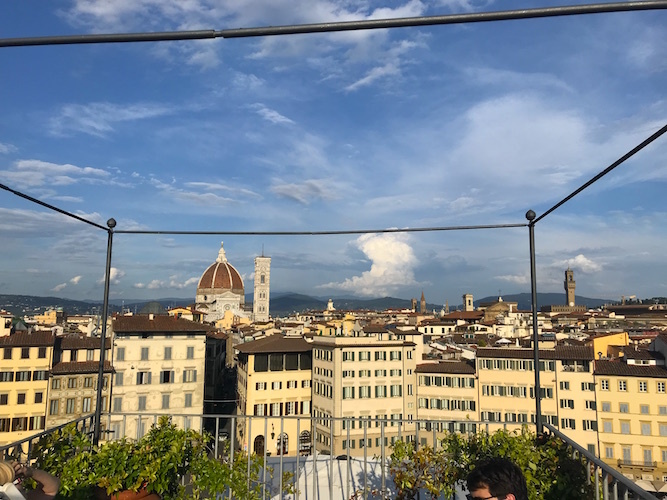 If you’d prefer panoramic views of the city and the Palazzo Vecchio, along with a secret window with a direct view of the Duomo Cupola, then the Balcony Suite would be perfect for you!